What does a scout do, anyway? 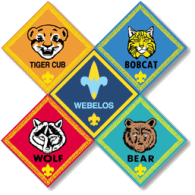 There are lots of great activities and events in store for our scouts this year! Join our monthly Pack meeting and regular Den meetings for learning and community building activities. Then join in our group events, like cabin camping, tent camping, model car building, the Pinewood Derby, and more! Check out our calendar for the details and join in the family fun and learning!